Part 3's dub is currently under way and there's even a Toonami commercial for it. I'm fairly optimistic. Sounds good. Are there dubs for parts 1 and 2? Huh, sounds cool. Might give me a reason to rewatch. I could barely tell their voices apart, generic dude voice for all of them, Joseph sounds too young, jotaro isn't deep enough, it just sounds wrong. Now I remember why going from sub to dub or vice versa is weird. I think the best was Jotaro, with Joseph being ok. But the rest sounded really weird. I have a question for y'all who read the manga. I just finished part 5 a couple days ago, and I've been trying to read part 6, but I was spoiled on a heck ton, and it's making it really hard to keep reading when the spoilers are always in the back of my head. Anyways, would it be wrong to skip the rest of the part because it has future relevancy, or is just that good? Time to bring this meme back. I will most certainly be tunning into part 5 when it comes out. Side note: Gio Gio is a hoot to play as in All Star Battle when you activate Golden Experience Requiem. I start flying all over the stage going "WHAT IS GOING ON? WHERE AM I?" with GER shouting while it flies. Addendum: I wasn't censor dodging, or at least not intentionally. No hard feelings, I just felt the need to clarify. Sorry if I come off as a little disgruntled or irritated. The teaser trailer for part 5!!!!!! 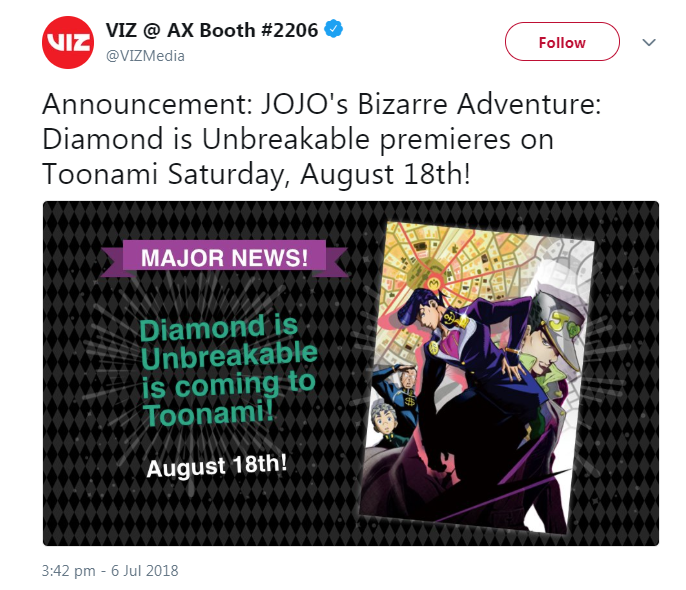 So not only has Vento Aureo getting adapted, but Diamond is Unbreakable is coming to Toonami this year as well. I've heard a lot about this show and how good it is. Luckily I was watching Toonami last night and they played an episode, so I decided to give it a try. I had to stop after no more than three minutes, because everyone has the exact same face, and it really weirded me out.